LUKOIL will buy shares of the Naryanmarneftegaz joint venture while speculation is that ConocoPhillips will also soon sell its stake in the Polar Lights oil development. ConocoPhillips is preparing to exit the Russian market. The company has put up for sale its stake in Naryanmarneftegaz, a joint venture with Russian oil major LUKOIL. The Federal Anti-Monopoly Service has already granted LUKOIL’s request to make the acquisition, which will raise its ownership to 100 percent. Experts believe that a similar fate awaits the Polar Lights project, where the American company is working with state-owned Rosneft. According to LUKOIL spokesman Dmitry Dolgov, the company’s board of directors approved the consolidation of Naryanmarneftegaz at its July 23 meeting. He did not specify the size of the acquired stake, but mentioned that a 100 percent interest in the JV is being consolidated through a ConocoPhillips buyout. According to LUKOIL financials, it owned 70 percent of the JV, while the remaining 30 percent belonging to Conoco. Even so, Naryanmarneftegaz was managed on a parity basis. The American oil and gas giant has been operating in Russia since 1990 and has invested more than $11 billion. Almost 70 percent of this ($7.5 billion) was spent on acquiring a stake in LUKOIL. ConocoPhillips became a shareholder in 2004, after setting up a joint venture to develop oil and gas deposits in the Timano-Pechora region. By 2006, it had upped its stake in LUKOIL to 20 percent. But four years later, the Russian company’s strategic partner said it was planning to sell half its holding. ConocoPhillips CEO Jim Mulva explained that the sale was necessary because the Russian government was handing over large deposits to Gazprom and Rosneft, while the business development outlook for private oil companies, let alone those with foreign ownership, was grim. ConocoPhillips fully divested LUKOIL last February. Yet analysts were confident that the Americans would retain their stakes in Naryanmarneftegaz (30 percent) and Polar Lights (co-owned 50/50 with Rosneft). The company had suffered some disappointments in its Russian projects. The Timano-Pechora region – more precisely the South Khylchuyu field – cost $4 billion to develop, and while South Khylchuyu was expected to hit its target output of 7.5 million ton per year in 2009, production actually shrank by 40 percent. Only 3.3 million metric tons were extracted in 2011, and 391,000 metric tons in the first quarter of 2012. LUKOIL took a $1.2 billion hit last March as a result of the revaluation of the South Khylchuyu reserves. Proven reserves fell 30 percent short of estimates owing to a mistake by geologists, and have been downgraded from 0.5 billion barrels to 0.14 billion barrels. Valery Nesterov, an analyst with Troika Dialog, said it was big oil’s biggest blunder in the last 20 years. ConocoPhillips’s financials are a good indication of just how rapidly Russia’s hydrocarbon reserves and production have shrunk over the past three years. The same applies to investments. The company invested $1.1 billion in joint projects with LUKOIL in 2010, but zero in 2011. Analysts believe the stake in Polar Lights will be sold soon, too. The company participates in developing five oil deposits of the Ardalinsky group, but Polar Lights has not been performing well in recent years. “Polar Lights oil production has been falling over recent years and is currently at slightly above 0.5 million metric tons [in 2011],” said Raiffeisenbank analyst Andrey Polischuk. He believes that ConocoPhillips will eventually divest all of its assets in Russia, including Polar Lights. Rosneft’s financials show that it has not invested anything in Polar Lights since 2009, and ConocoPhillips’s financials make no mention of any investment or balance in the joint venture either. 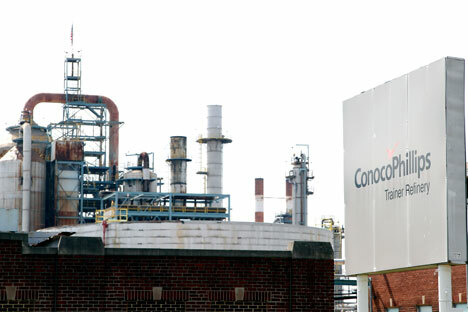 ConocoPhillips decided to restructure its business several years ago and has been selling off all its low-yielding projects in accordance with this strategy, said Valery Nesterov. The analyst estimated the value of ConocoPhillips’ stake in Naryanmarneftegaz at $350–400 million before capital expenditures. First publihed in Russian RBC Daily.